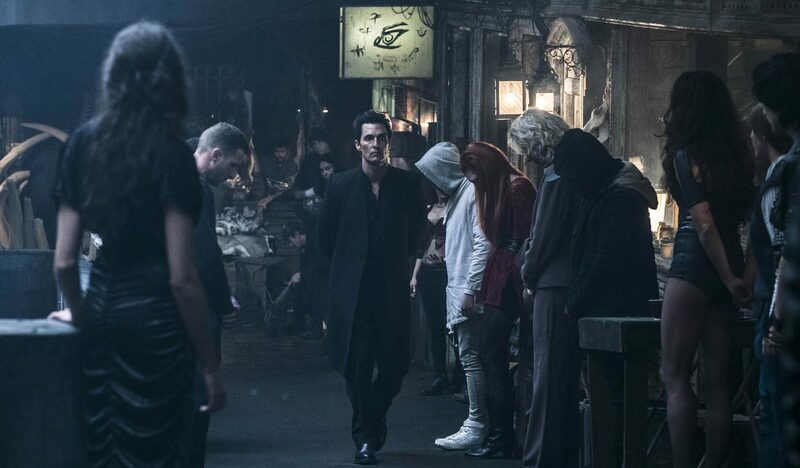 NEW YORK (CNS) — Awash in high-flown metaphysical hooey, director and co-writer Nikolaj Arcel’s dull sci-fi fantasy “The Dark Tower” (Columbia) is inappropriate for the impressionable. As for grown viewers, they should be prepared to slog through an involved exposition of non-scriptural ideas borrowed from the series of novels by Stephen King on which the film — penned with Akiva Goldsman, Jeff Pinkner and Anders Thomas Jensen — is built. Extending rather than adapting the books, the movie uses the psychic nightmares of troubled New York teen Jake (Tom Taylor) to introduce us to a distant world — one of many — and the cosmic battle being fought out there. This struggle pits villainous wizard Walter O’Dim (Matthew McConaughey), aka the Man in Black, against Roland Deschain (Idris Elba), aka the Gunslinger. O’Dim is bent on destroying the supernatural structure of the title which somehow, so we’re informed, keeps the evil lurking at the edges of the universe at bay. The lone remaining member of a group of Old West-style gunmen still resisting O’Dim and his cohorts, Roland is not only out to save the tower but yearns for revenge against O’Dim, whose spells have killed off every ally who has ever stood at his side. While on the run from some of O’Dim’s minions in the Big Apple, Jake manages to get himself transported to Mid-World, one of the planets where this feud is being played out. Conveniently, the first person he encounters is Roland. Despite an initially gruff reception, Jake convinces Roland that he can be of service to the cause. The bond that eventually develops between the two — Jake’s fireman father died in the line of duty — is one of the few potentially touching aspects of this tangled tale. O’Dim’s method of assaulting the tower involves the torturous extraction of energy from the minds of kidnapped children. Since Jake has the gift of second sight, what the script terms “shine,” to an unrivaled degree, his psyche would represent the equivalent of a nuclear missile launched against the vital building — if, that is, O’Dim could only get his hands on the lad. Roland is also endowed with paranormal powers, as too is a minor character who can read people’s thoughts and communicate with them without speaking. All this is portrayed very positively in a way that might mislead the poorly catechized. As for the religiously well-grounded, they would be wise to spare themselves the necessity of sifting through this pile of New Age nonsense. The film contains occult themes, much gunplay and other violence, including torture, but with little gore, a few uses of profanity and a couple of crude terms. The Catholic News Service classification is A-III — adults. The Motion Picture Association of America rating is PG-13 — parents strongly cautioned. Some material may be inappropriate for children under 13.